Well, steamed fish is the easiest way to fix a quick dinner meal if you are a working class. Simple, easy, yet healthy choice of cooking. Complete the meal with just a bowl of rice, we have its flavourful sauce here to pair it so perfectly. 1 tail of whole Red Snapper, scaled, removed internals and washed. 1) Wash and pat dry whole fish gently with kitchen towel. Sprinkle pinch of salt and pepper to season both sides of the fish. Stuff ginger slices into the slit of fish stomach. Set aside to season for 10 minutes. 2) Lay fish on a porcelain dish. Spread bean paste, sprinkle sugar and top minced garlic on the fish. Lastly, drizzle tamarind sauce. 3) Get ready the steamer or heat wok filled quarter-full of water over high heat. When water is boiling, place fish dish in the steamer, or on a wire rack in the wok. Steam fish for 10 – 12 minutes. Serve hot. 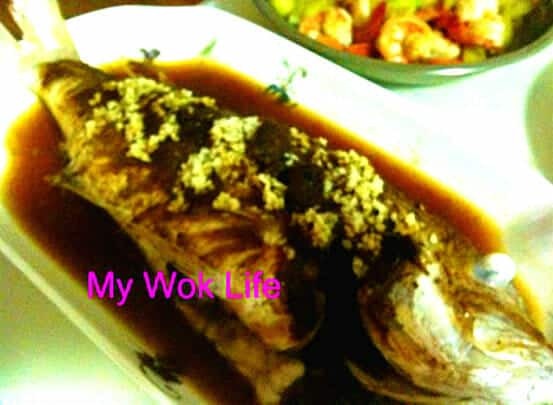 A large portion of steamed fish with bean paste counts about 180kcal.